Japan is home to more than 500 ski resorts (ski-jo) and the Japan ski fields are ranked as some of the best in the world. Offering an incredible amount of choice, Japan ski fields range from tiny local ski hills to huge mega-resorts, which are the most popular choice for powder hounds and overseas visitors. 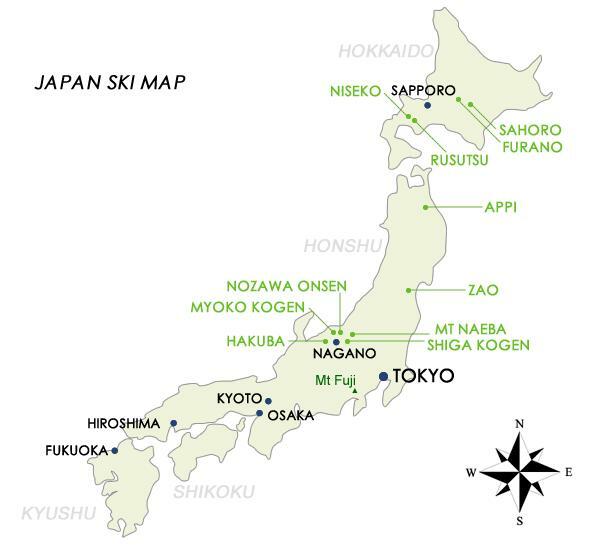 The Japan ski map below offers some inspiration for your ski holiday and is a handy reference for first time visitors to Japan. For example, located on the north island of Hokkaido you’ll find one of Japan’s most popular ski resorts, Niseko as well as Rusutsu, however these are also some of the furthest away. If you’re more interested in staying closer to Tokyo so that you can also enjoy a bit of sightseeing, Niigata and Nagano are some of the more popular ski areas. As the Japan ski resort map below shows, the renowned ski resorts of Hakuba, Nozawa Onsen and Shiga Kogen are located within these regions. Despite their popularity, Japan ski trails aren’t particularly crowded meaning there are plenty of ‘freshies’ on offer. Our map of ski resorts in Japan below will help get you started. From the popular Niseko resort on the northern island of Hokkaido to the famous slopes of Hakuba in the Nagano Prefecture, Japan ski fields vary in size from smaller one-lift slopes to an all-out ski and snowboarding extravaganza at the larger resorts with dozens of runs and ski trails. Although there are no ski fields in metropolitan Tokyo, there are a number of excellent Japan ski trails accessible with a daytrip from Tokyo. In fact, there is some outstanding snowboarding and skiing options just 90 minutes from Tokyo on the shinkansen rail line. Experiencing the snow of the Japan ski fields doesn’t necessarily mean skiing or snowboarding. In fact for children or beginners, there are plenty of fun options including designated play zones. Many resorts offer some fun alternatives to serious snowboarding and skiing including snow tubing and sledding. The ski resort of Nozawa Onsen is also known for its proximity to the region’s famous hot springs which makes for an interesting attraction as part of your Japan ski experience, not to mention an excellent way to warm up. Our Japan ski map shows the popular ski destinations in the country.